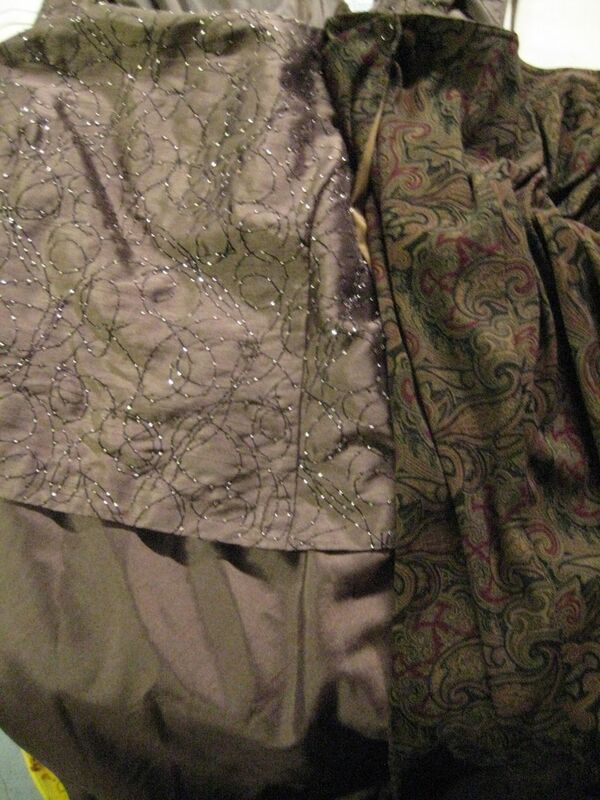 I also found a rather sad mother-of-the-bride type dress (7.99$) and a paisely wrap skirt in the wrong size ($1.50). I decided to make a festive little petal-style sleeve on the jacket to take some of the corporate out of it. I've pinned the lining so it won't shift when I cut, and freehanded a cutting line. 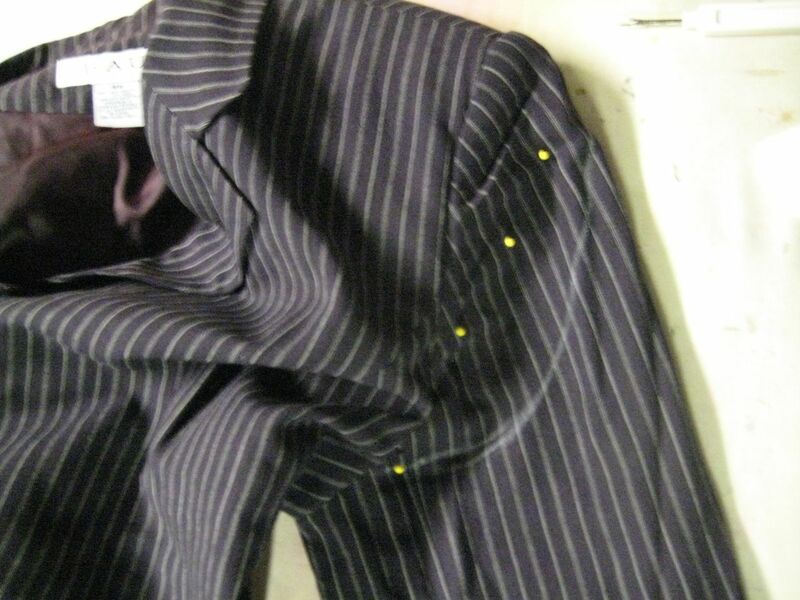 I also hacked the body of the jacket off just below the first button. 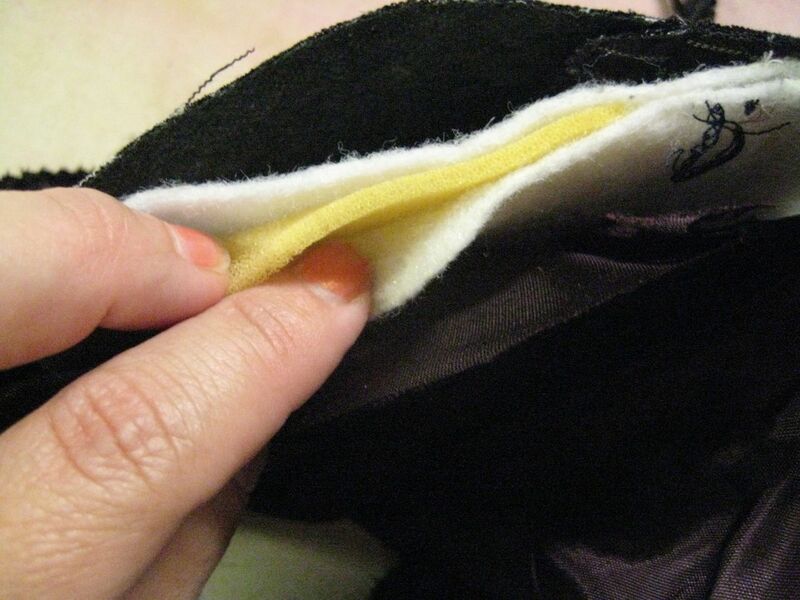 All the raw edges were sealed with a zig-zag stitch. 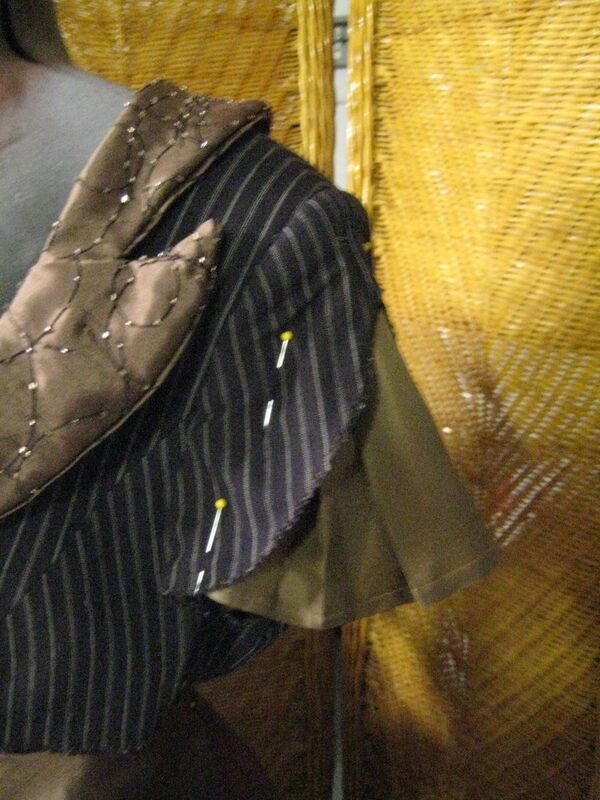 Somewhere during this process, I figured out that I was dealing with a rather cheaply made jacket. 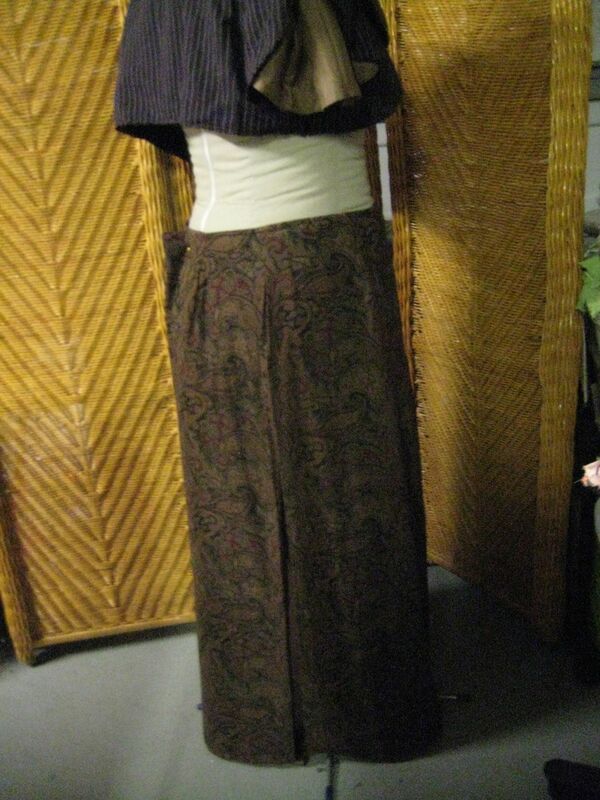 The body lining was weirdly twisty and the sleeve linings weren’t the same diameter as the sleeves. Bummer…. I’d love to tell you that there’s some magical, right way to sort that. There isn’t. Do whatever it takes, as long as you can hide the ugly. I cut the neck on the line I marked. Since I had the jacket open anyway, I decided to lighten up the shoulder padding by taking out the denser foam in the middle. 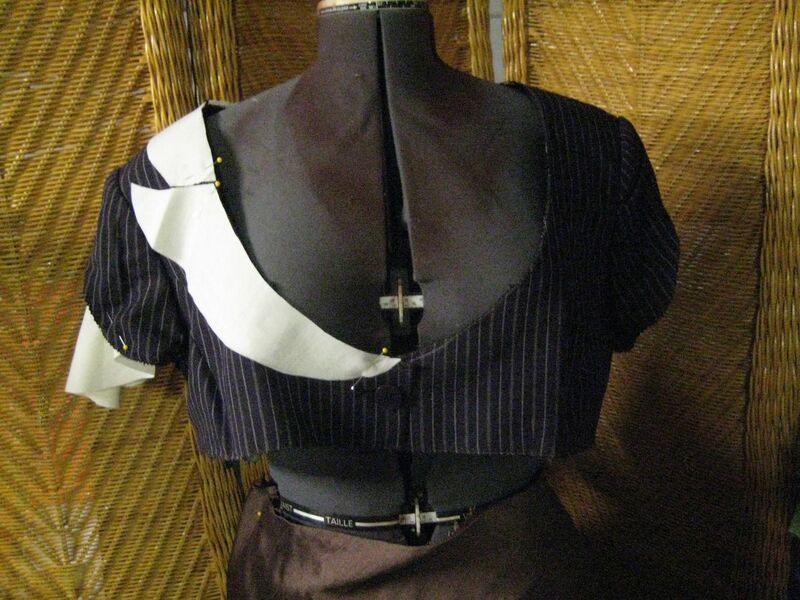 I sealed the new neckline with a zig-zag, then I figured I'd just drape a cute little collar. Hey, wow, way to make it sound easy, missa…. 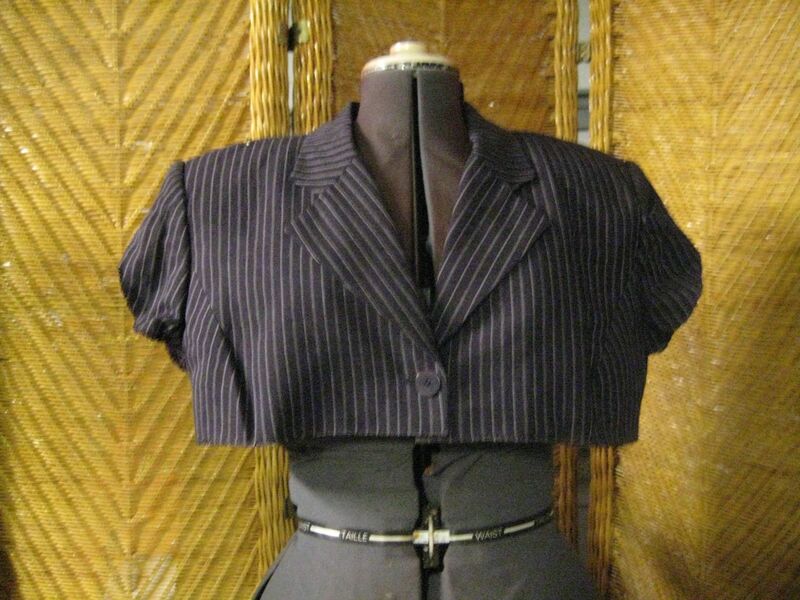 No, seriously, this kind of collar really is easy to drape, because it lies flat against the coat. So you’re really just drawing it on muslin and checking to see if it works. 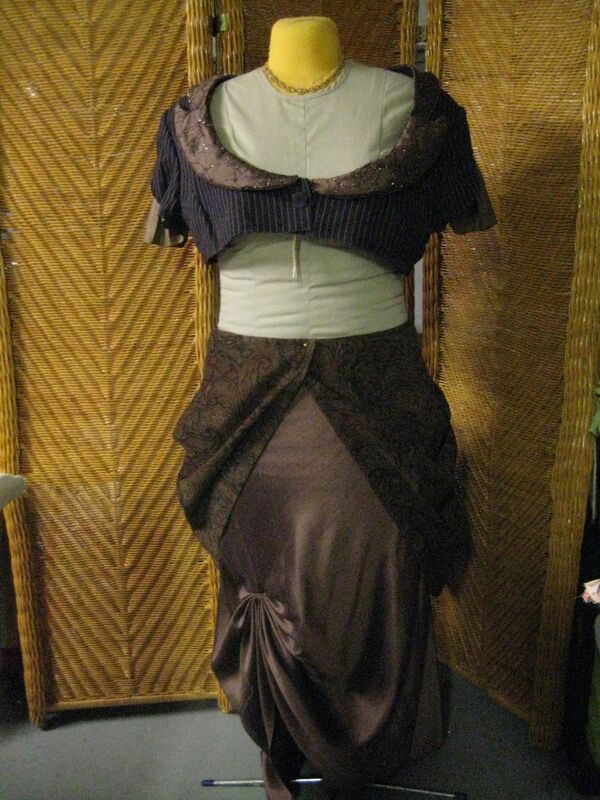 Here's the back collar mid-drape. I'm using a pencil to trace the edge of the collar, then sort of drawing in the bottom edge of collar where it looks good. I just the collar pieces out of the beaded top from the dress, and the undercollar out of the unbeaded back from the drop. 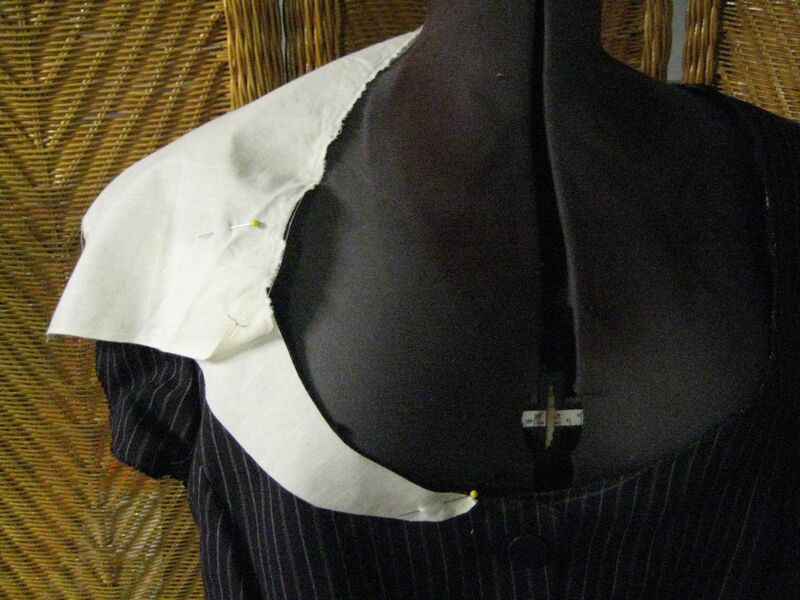 I sewed the collar layers together, then sewed them right-sides together. I left a few inches at the center back open so I could turn the collar right-side out. 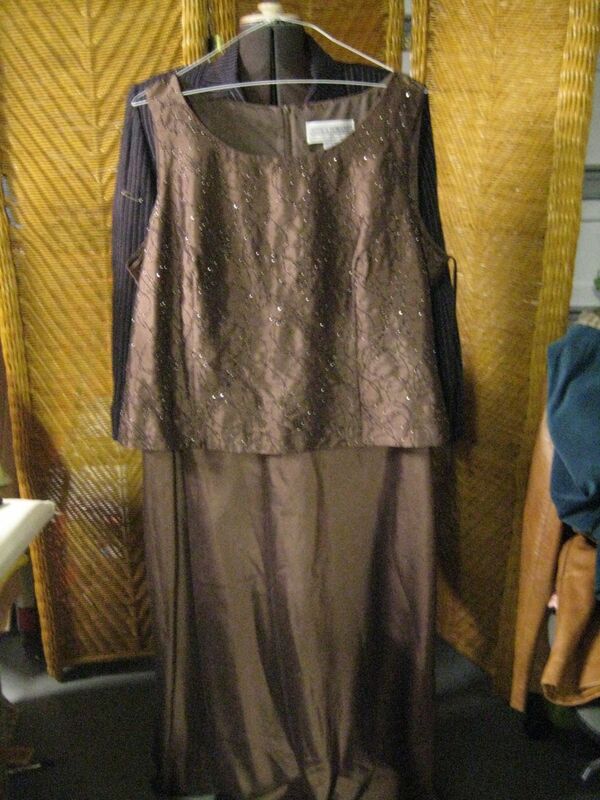 This would have been very simple if the fabric hadn’t been beaded. I keep a pliers by the machine so I can crack beads that are in the path of the needle. 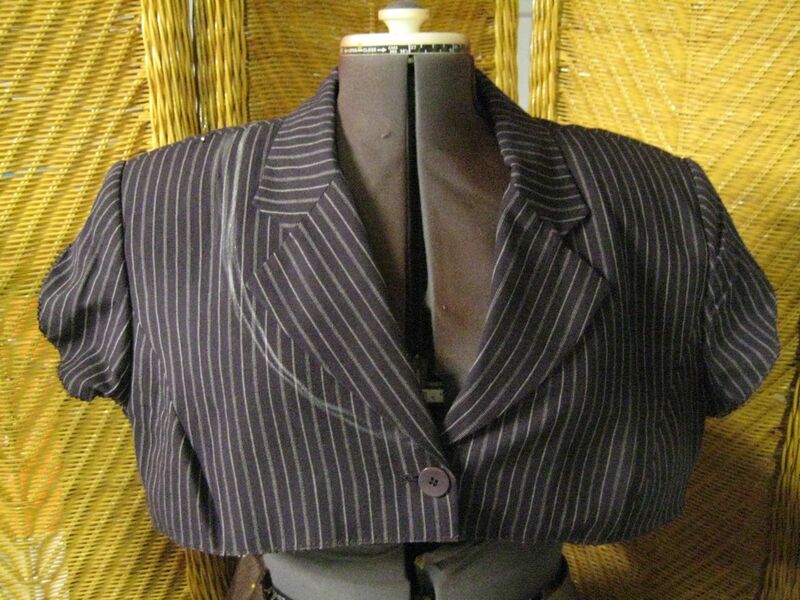 Then I whip stitched the collar to the neckline of the jacket. I've pinned in a simple little flutter sleeve inset, made from a 13" long rectangle of lining fabric from the skirt lining. 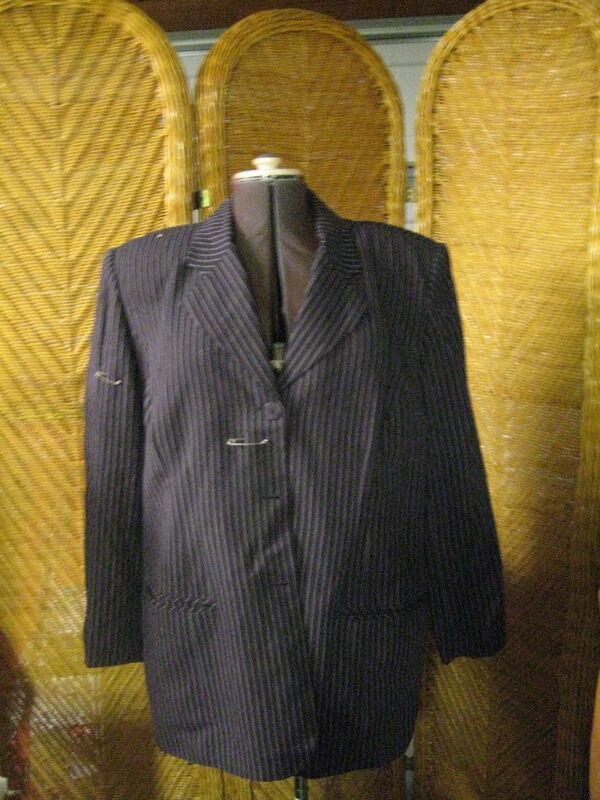 It's pleated down with a set of stacked box pleats, so it's a little more tailored. 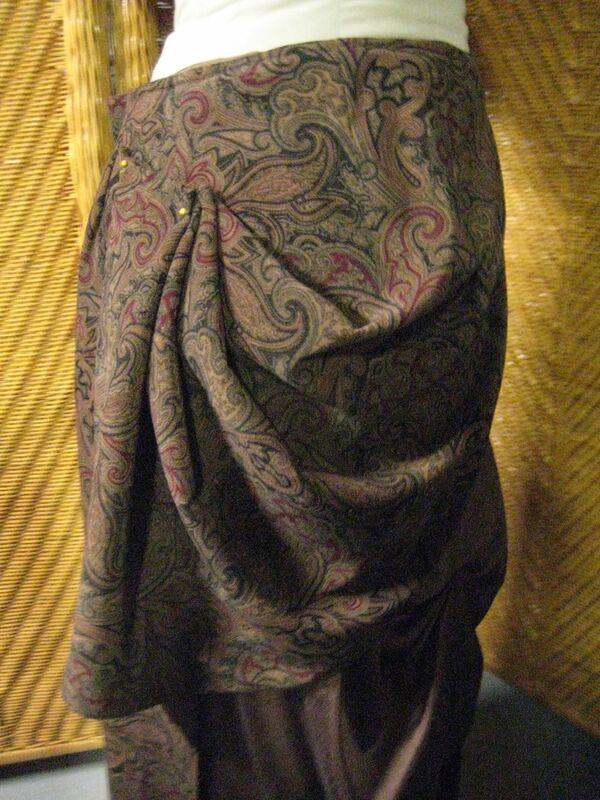 For the bustled overskirt, I'm using that paisley wrap skirt. I've split the three panels at the seams, up to the high hip area. 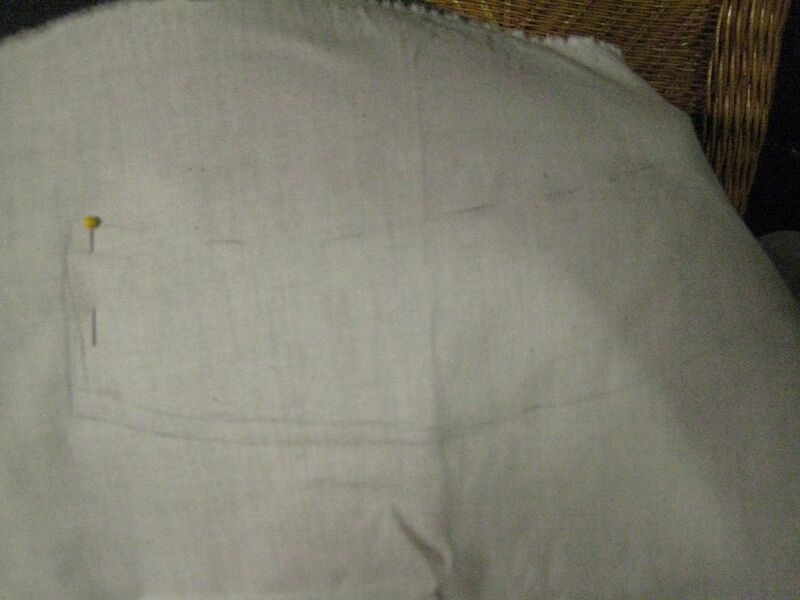 The sides are bustled by pulling the bottom corner of the front panel up to the high-hip on the side back seam. Then I pleated all the excess neatly. 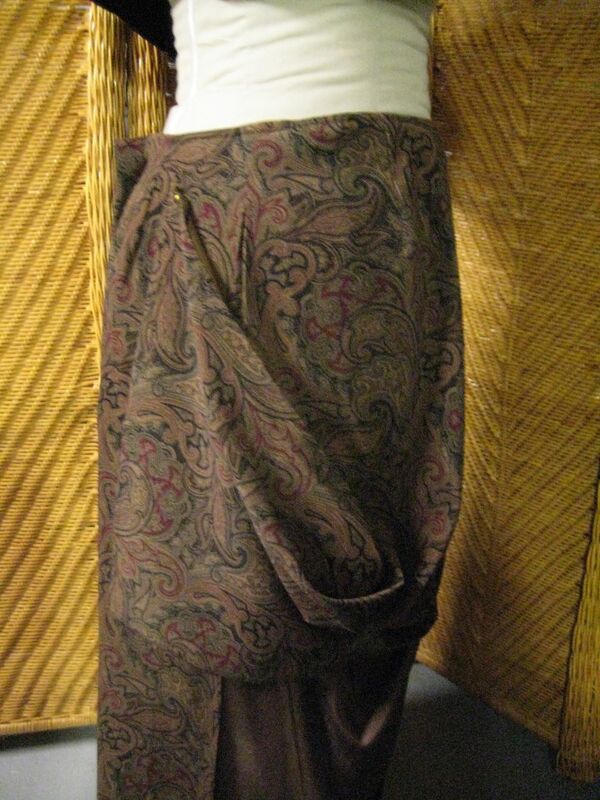 If you've ever worn a sari, it's the same process as that awkward bit in the middle when you have to make the extra half yard around your waist go away. For reference, the edge hanging vertically now was the hem before. 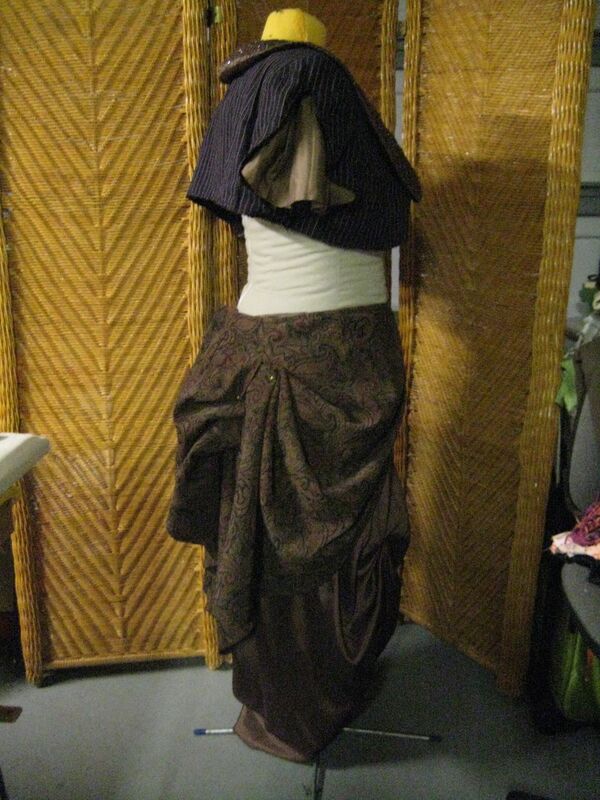 For the back bustle, I just stacked a set of pleats along the vertical edge of the side draping. I left enough of the back panel hanging free so that the bottom corners of the side and back panels hang at the same level. 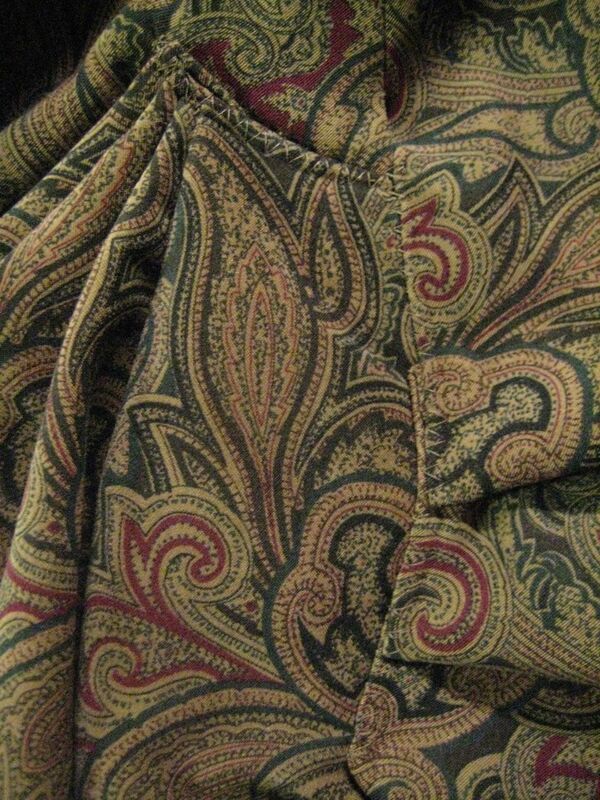 Because the paisley pattern is quite busy and my draping pleats are flat, I just sewed everything down with a zig-zag. At some point, I removed the skirt from the sad MoB dress, bound the top edge off with ribbon, and it became the underskirt. Since the bias prevents me from slitting it, I raised a section with a series of flat pleats. I ordered the corset from corset-story.com for $75. (What?! 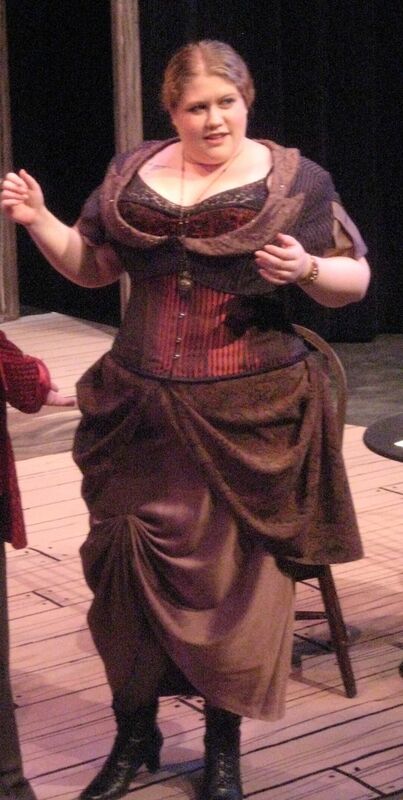 Missa, you bought a corset? Seriously, there are only so many hours in a day.) I’m pretty pleased with the construction, and I can’t complain about their prices. Total Time: about 6 hours. LOVE THIS. 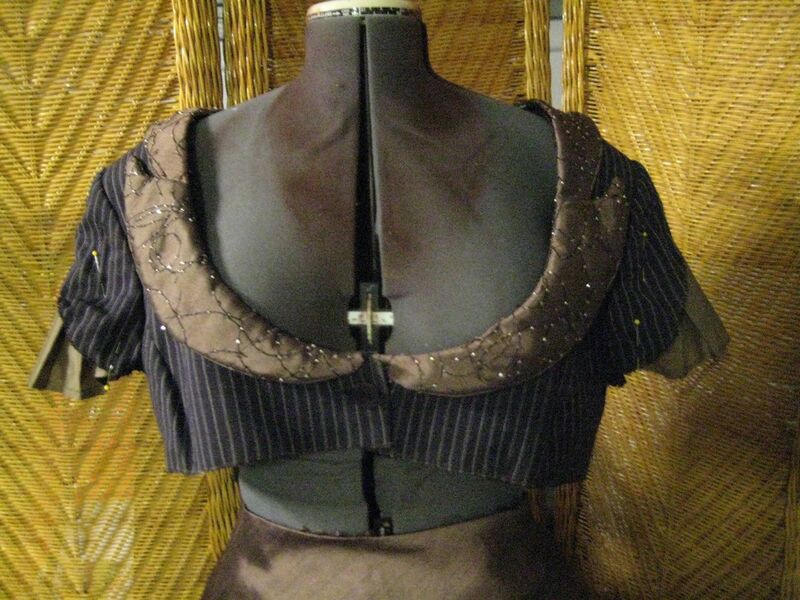 We are also doing a “Thrift to Fashion” Steampunk class for MNSOC for our Steampunk Christmas Carol in December. And that corset site is excellent! I’ve never tried a corset from corset-story, think I’m going to now! Looks gorgeous!